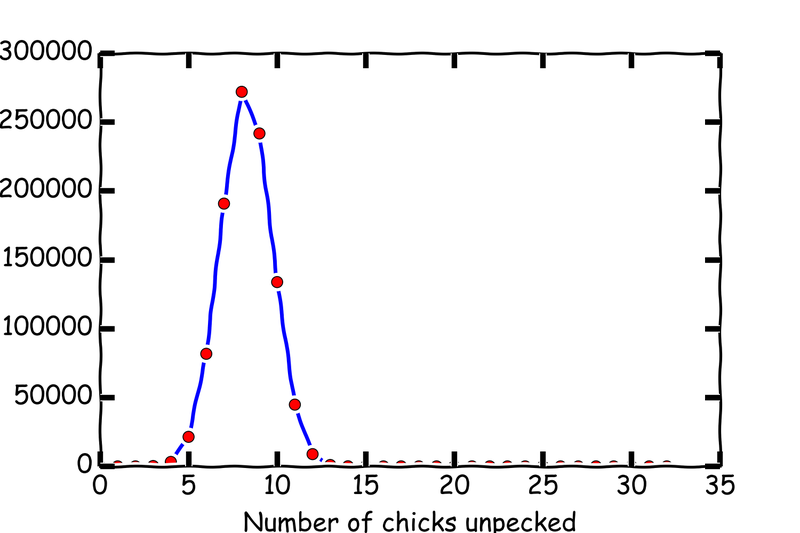 Only one of these options results in the chick being unpecked, and so the expected number of chicks unpecked in a circle of 100 is one quarter of this number, or 25. But it's the kind of maths that makes me ask more questions. 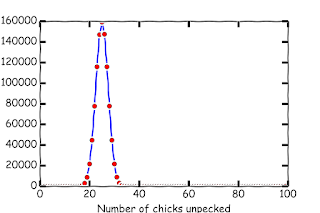 While 25 is the expected number of unpecked chicks, what is the distribution of unpecked chicks? 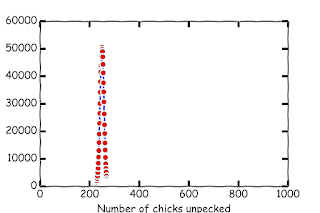 What I mean by this is that they peck left or right at random, there might be 24 unpecked chicks for one group of a hundred chicks, 25 for the next, and 23 for the next. 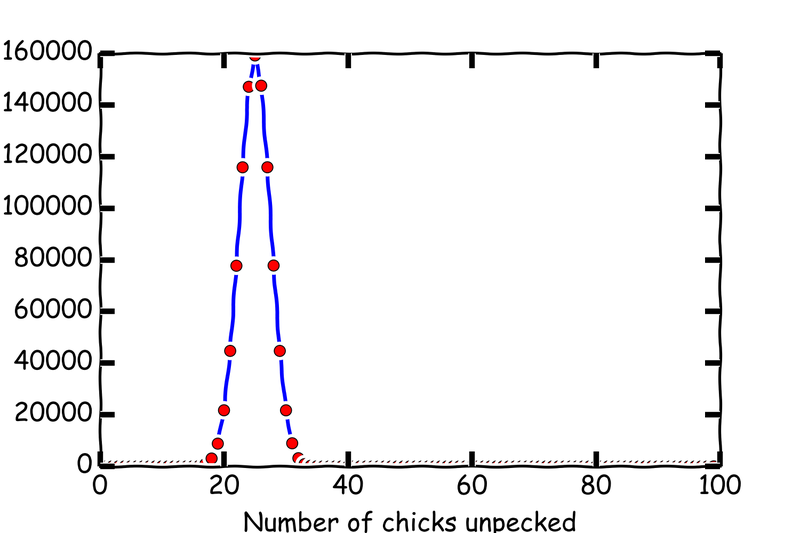 So, the question is, given a large number of 100 chick experiments, what's the distribution of unpecked chicks? I tried to find an analytic solution, but my brain is old, and so I resorted to good old numerical methods. Generate lots of experiments on a computer, and see what the outcomes look like. 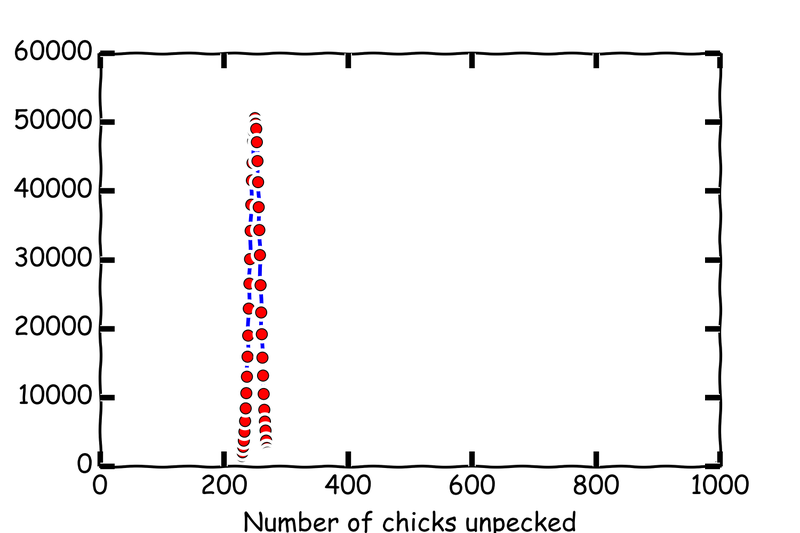 But there is an issue that we have to think about, namely the question of how many different configurations of chicks pecking left and right can have? That's a lot of possibilities! How are we going to sample these? 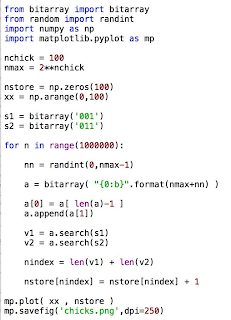 Well, if we treat a 0 as "chick pecks to the left", and 1 as "check pecks to the right", then if we choose a random integer between 0 and 2100-1, and represent it as a binary number, then that will be a random sampling of the pecking order (pecking order, get it!) 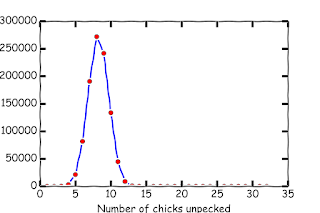 As an example, all chicks peck to the left would be 100 0s in binary, where as all the chicks peck to the right would be 100 1s in binary. So, the first bunch of chicks peck to the left, then we have a mix of right to left pecks. But how many of these chicks are unpecked (remembering what the original question)? Well, for any particular chick, it will be unpecked if the chick to its left pecks to the left, and the chick to its right pecks to the right. So, we're looking for sequences of '001' and '011', with the middle digit representing the chick we are interested in. There is a little extra in there to account for the fact that the chicks are sitting in a circle, but as you can see, the code is quite compact. OK. Let's run for the 100 chicks in the question. What do we get? Yay! The unpecks peak at 25, but there is a nice distribution (which, I am sure, must have an analytic solution somewhere. 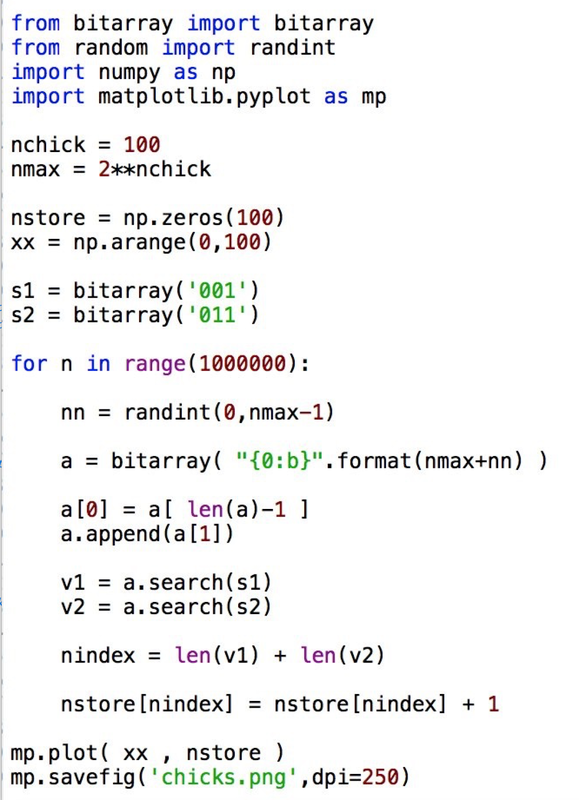 But given the simplicity of the code, I can easily change the number of chicks. What about 10 chicks in circle? Hmmm. Interesting. What about 1000 chicks? 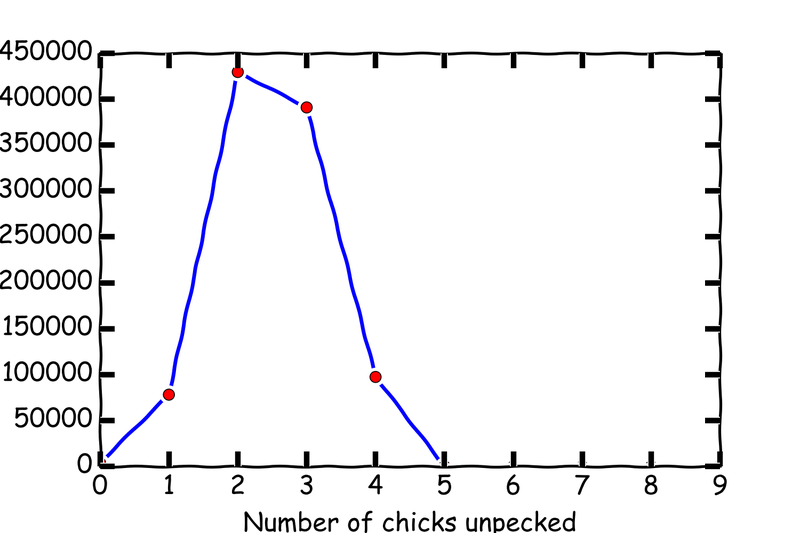 Most likely number of unpecked chicks is 8, but again, a nice distribution. Now, you might be sitting there wondering why the heck I am doing this? Well, firstly, because it is fun! And interesting! It's a question and it is fun to find the answer. Secondly it is not obvious what the distribution would be, and how complex it would be to derive, or even if it exists, and so a numerical approach allows us to find an answer. Finally, I can easily generalize this to questions like "what if the left pecks are more likely than right pecks by a factor of two, what would the distribution be like?" It would just take a couple of lines of code and I would have an answer. And if you can't see how such curiosity led examinations are integral to science, then you don't know what science is. 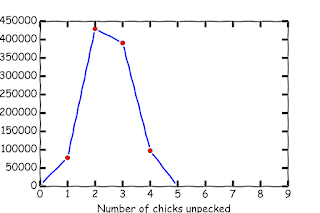 I have re-blogged this at https://newtonexcelbach.wordpress.com/2017/06/16/counting-non-pecked-chicks/ with some added Excel and VBA versions. You probably won't be very impressed with the pure Excel versions (which are much slower), but you might like the Excel/xlwings link to your Python code. Is an elephant heavier than a mouse? Wow. It's been a while since I have written a blog post. Much of this is because of work and travels, and book writing (more news on that in the near future). But I'd like to get into blog writing, so here's a little science musing. Now, you are probably saying "well, of course". Surely event the heaviest mouse weighs less than the newest born baby elephant, so why am I asking such a stupid question. Well, because science can never really prove that an elephant is heavier than a mouse. I know, I've gone and put that word in, and I've written about how proof has no place in science. But let's examine this in a little more detail.